Sunny, light living space with 2 bedrooms and private garden. Use of two outdoor pools, ONE OF WHICH IS HEATED. 2 good-sized bedrooms / 2 bathrooms. Sleeps 4. Ideal for a one couple, two couples or small family. Would be suitable for winter lettings. Great centre for walking. FLEXIBLE START DATES THROUGHOUT THE YEAR (minimum 5-day stays). This charming property is located within an ancient Priory which has been nicely converted to a dozen or so houses and flats. The owners have taken great care to ensure the house is comfortable and welcoming for guests. The local village (Tourbes) is just three minutes away along a quiet country lane. This spacious maisonette was formerly part of the estate manager's (the "ramonetteur") dwelling and is spread over three levels in the oldest part of the property. The walls are thick enough to keep the house cool even in the hottest of Mediterranean summers - "natural air conditioning"! In a corner of the living room the brick roof of a 18th century bread oven (situated at lower level in a neighbouring flat) is a reminder of former times. The staircase leads to two spacious west-facing bedrooms looking over the courtyard of the Priory. The master bedroom has a four-poster bed, an antique dressing table as well as a wardrobe and large chest of drawers. Its double-lobed window offers a wonderful view over vineyards towards the rugged hills of Haut Languedoc. The second bedroom with two single beds provides storage space in the built-in cupboard. There is also an antique writing desk and chair. The two bathrooms are on the ground floor and next to the second bedroom. Both have been recently redecorated and refurbished. A smart contemporary three-seater sofa and two reproduction Louis XV armchairs provide comfortable seating in the living room. There is WiFi and a new television set as well as four chairs and an antique round oak table in the dining area. A large buffet made of cherry wood acts as a separation between the kitchen and the living room. The fully equipped kitchen benefits from a new oven, microwave and dishwasher. Close by there is a small utility area with a new washing machine. The flat is in overall excellent condition and decorated with delightful pictures and paintings, some by local artists. It has its own small, west-facing 'jardin' where one can sit in privacy behind hedges of oleanders while enjoying breakfast, an ‘apéritif’ or a barbecue. This property is ideal for a couple as a romantic getaway, for two couples holidaying together or for a small family. A reception area: open to the outside and laid out for car parking in the shade of the trees – pines, plane trees and mulberry trees. The impressive entrance is bordered with a magnificent spring-flowering mimosa and Christmas flowering yuccas. A courtyard garden: the former interior courtyard has been transformed into a garden, surrounded on all four sides by buildings with, in the centre, an 8th century well. The varied flowerbeds and typical Mediterranean plants (palm trees, cypress trees, laurel bushes, bamboo, and pomegranate) shelter the private gardens, securing a space for relaxation and intimacy to guests or residents. Orange blossom, roses, verbena, laburnum, wisteria, begonia, jasmine, and irises provide an array of scents while the variety of flowers ensures that the garden is in bloom throughout much of the year. A waterside garden: close to the vestiges of a Roman road, it enjoys the shade of oak trees, plane trees, cedar trees, Judas trees and eucalyptus which border the stream of “Saint Martial” where in the past children have built dens and caught tadpoles. The leisure gardens provide a fitting place for ball games, badminton, table tennis or “boules”, or just relaxing with a book. Other visitors in the gardens could include squirrels, hoopoes, turtle doves and pipistrelle bats, not forgetting the sun-loving geckos. As the sun goes down the chorus of bird song and unforgettable chirps of cicadas resonate through the warmth and stillness of the evening. 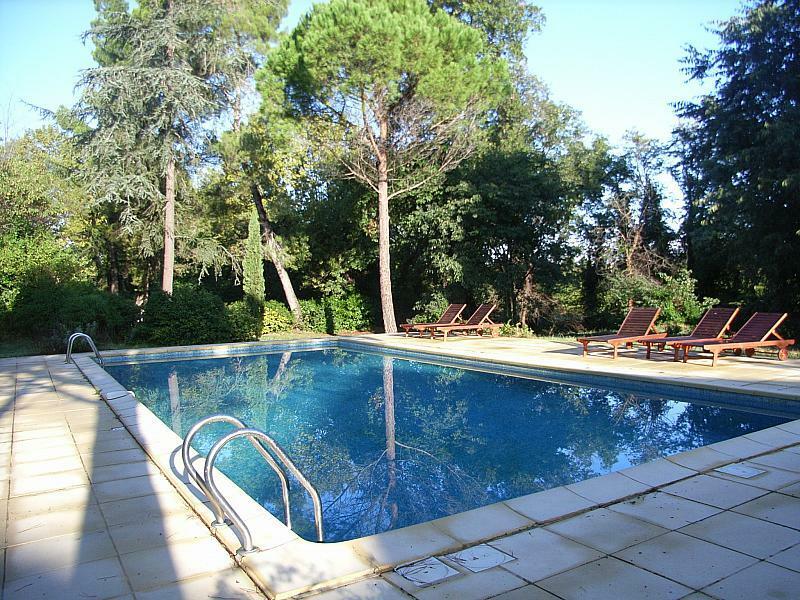 There are two large pools, both secured, where one can sunbathe and rest in the shade of fig or pine trees. One of the pools, at the rear of the property, is heated while the pool beside the entrance to the Priory has a small paddling area attached to it. This haven of peace enjoys proximity to villages with restaurants, shops and other amenities, as well as many places of historical interest, including the captivating medieval town of Pezenas. Neither is it far from the Mediterranean coast. Finally, Le Ramonettage is ideal for nature lovers and keen walkers alike being so close to the Regional Park of the Languedoc. - Shower room + basin + WC on ground floor. - Shower room + basin + WC on mezzanine floor. Bedrooms : 1 double bed and a set of twin beds. Brand new mattresses on single beds. Bathroom : 2 shower rooms with WCs. Very recently retiled and decorated. Kitchen : Fridge, hobs, microwave, washing machine, dishwasher, coffee maker and toaster. Dining : Seating for 5. Lounge: Seating for 4, WiFi. Cable TV. Garden : Table with seating for 2. Shared small communal room : library with books in English, French and German. This region is an area of dramatic contrasts with miles and miles of glorious sandy beaches yet there is ski-ing to be found only a couple of hours away in the Pyrenees. We have endless vineyards and a tour of this region reads like a wine list. Le Ramonettage offers an excellent base of sites and sight-seeing. It is only half an hour to the Mediterranean beaches and there is great river bathing on the Rivers Orb and Hérault. Inland are amazing gorges and rivers and a myriad of fortresses and castles dating from the bloodthirstly Cathar times. - Fabulous hot, sunny weather. - Beautiful long sandy beaches with shallow water, ideal for young children. - Gorgeous countryside with miles and miles of vineyards, stunning rivers and gorges, pretty medieval villages and bustling cities. - Wealth of historical monuments and castles, the amazing Cityof Carcassonne. - Great dining experiences whether it be on the beach or in a medieval village amidst the vineyards. - Good, locally produced wines at prices you wonï¿½t believe! Here are some highlights, not to be missed! The beaches at Valras Plage, Serignan Plage and Narbonne Plage are all very suitable for children and a quieter option to the beaches closer to Cap d Agde. They have sheltered bathing areas for children and Valras Plage has some great play equipment on the beach. For all the fun of the fair head to Cap d Agde with the fabulous Aqualand water sports park as well as plenty of water sports, boat trips, a beautiful harbour, golf, casino, fashionable shopping, nightclubs, waterfront restaurants and several childrens theme parks. At Vias Plage, there is a funfair open during July and August called Europark which is very popular with teenagers. At Grau d Agde you can take a guided excursion between the Canal du Midi, Thau lagoon and the Herault river. Also boat trips available at Valras Plage, either trips up the coast or even sea fishing ones. Take the time to visit the Canal du Midi, a beautiful tree-lined Canal which links the Atlantic with the Mediterranean anc which has miles of flat walks along the shady tow paths. Explore it on rollerblades, on horseback, by bike, by barge or simply on foot. Whichever you choose, it will be an ideal way to discover one of the longest canals in France. Barcelona is just 2 1/2 hours away, easily achievable for a lunch in Spain! About an hour to the south there are the Pyrenees. Take a day trip (about 3 hours each way) to Andorra. The Massif Central starts only a short distance to the north. There are plenty of places offering horse-riding in the area. One is the St Jean Ranch in Serignan Plage which offers a range of activities such as excursions, horse-drawn carriage rides, horse rides on the beach or at sunset, and even excursions for experienced riders. Portiragnes Plage also has a horse riding stables ï¿½ coming from Portiragnes towards Portiragnes Plage, you will see it on your left just before you get to the town. We have so many lovely traditional wine-producing villages in this area, all with weekly street markets and of course those sun-blessed Mediterranean beaches. If you enjoy the atmosphere of medieval streets, you will love walking through the old part of these villages, with their tiny squares, ancient porches and ramparts. Most villages have several fetes and festivals throughout the year, including the famous processions with floral floats. The village of Minerve is classified as one of the Prettiest villages in France and is worth a trip. It is off to right on the way to Carcassonne is a must for those interested in the history of the Cathars. Many of the local vineyards offer free tours and wine-tasting. There is one at La Baume between Beziers and Pezenas and the tour was offered in English. Great fun and very interesting to see how they turn the grapes into wine. The coastal plain provides literally hundreds of Domaines for superb wine-tasting - its obligatory! Samples will be generous, and in many cases guided tours are provided. Renaissance Pezenas is worth a visit, with its winding cobbled stone streets housing Antique Shops and Art Galleries. There is a large open-air market every Saturday which is well worth a visit. The town boasts that it was once the home of Moliere and there are many craft shops, restaurants and beautiful buildings. During July and August the craft shops are open until midnight some nights and you will often find street theatre groups to entertain you ! The architecture and the streets of the village are worth a detour. The centre has been magnificently maintained and renovated. A destination particularly appreciated by the British due to its luxurious charm and refined boutiques, Pezenas has a wealth of buildings and hotels in characteristic architecture. Moliïere built up his success in Pezenas, which he had chosen as his favourite place to stay. The town is also the birthplace of the singer Boby Lapointe and maintains its tradition as a town of street entertainers and artists, with theatricalised guided tours and numerous art galleries and artists workshops. The town also has several unusual museums such as the museum of toys and delights of yesteryear, or the door and wrought iron museum. Worth a visit on Saturday for the large market. The food market closes at 12 noon but everything else stays open. Wander through the old quarter, the artisan shops are very interesting and are all one off individual stores. FLEXIBLE START DATES (subject to a minimum stay of 5 days). Recently visited by our team. Recommended. Brand new kitchen appliances include dishwasher, microwave, oven and washing machine. Baby sitting, sauna, tennis, bikes... just ask at reception.